***SOLD OUT*** Santa.Cruz.Studio 2/3: BirchBark Foundation Fundraiser! Open to the public! Sorry, this fundraiser is SOLD OUT! Help us make a difference in a pets life! Please join BirchBark Foundation for a few hours of fun and creativity on Sunday, February 3rd. 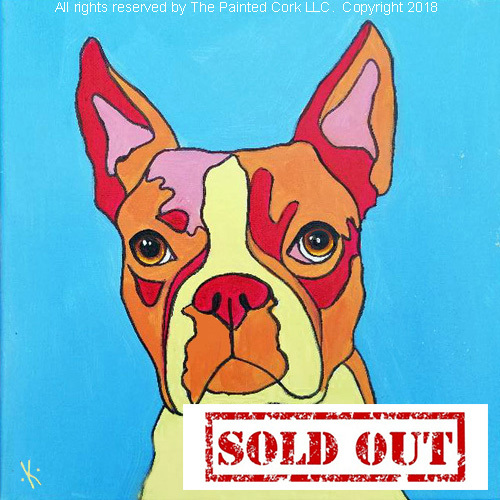 The artists at The Painted Cork will guide you through the step by step process of creating a colorful painted portrait of your pet while enjoying raffle drawings and complimentary wine and snacks! Dr. Merrianne Burtch, founder and President of BirchBark Foundation will be on hand to provide an update on BirchBark’s mission of helping pets and their families through medical crises. Since 2013 BirchBark has saved more than 200 pets by providing financial support to low income families in need. A significant portion of the revenues from this event will go towards helping BirchBark Foundation save more pets in 2019. This BirchBark event will make a perfect gift for any of your pet loving friends and families. Let us know by contacting us at and we will provide a gift certificate that you can give as a gift! Please join us - you can help make a difference in helping save a family’s pet and take home a great piece of art as well! This class is a colorful twist on our classic "old school" version of Paint Your Pet which is more realistic in construction and color. In this class we will concentrate on all colors of the rainbow and channel our inner Warhol! Let's PAINT FOR A PURPOSE! This class includes 3 hours of professional art instruction and all art supplies! Simply send us a high resolution HEAD SHOT photograph of your pet with clarity and good lighting and we will hand sketch the image of your pet onto a 12 x 12" stretched canvas for you prior to the class! Please send your picture to . During the class, we will guide you through the step by step process of creating a colorful painted portrait of your pet! Please do know that the better the photograph, the better your drawing and painting will be! Background elements in your original photo will be eliminated all together. THIS CLASS IS FOR ONLY ONE PET. We will have an 4x6 picture of your pet for you to paint from. snacks! BirchBark will be providing complimentary wine and appetizers, but feel free to bring your own if you like. We also supply complimentary paper plates, cups, napkins, plastic cutlery, plastic wine glasses, bottle openers, designated food tables and a full refrigerator for your use. Paint Your Pet is a non-refundable class and if you must forfeit, your donation will still help the BirchBark Foundation cause.